It’s not every day you’re asked to help create a clinical practice guideline that will be used by dentists all over the United States. During the end of my second year in dental school, I was asked just that. I was conducting research at Midwestern University College of Dental Medicine-Illinois and was fortunate enough to visit the ADA headquarters in Chicago with my research mentor. I met the Evidence-Based Dentistry Team, or “EBD Team” as I so admirably called them. They were preparing to develop a clinical practice guideline, which includes evidence-based guidance for questions relevant to everyday dental practice. The guidelines are incredibly useful for informing clinical treatment decisions and optimizing patient care, and the chairside guides are especially helpful as a quick reference. This particular guideline the EBD Team was preparing was on nonrestorative treatments for caries management, and much to my surprise, I was invited to work on the systematic review informing the guideline. Identify the expert panel, consisting of a group of clinical and subject-matter experts. Train panel and research team to ensure consistency in process and methodology. Determine scope, purpose and target audience for the project. Define PICO (Population, Intervention, Comparison, Outcome) questions. Conduct systematic search of the literature. Screen title, abstracts and full-texts of articles captured within the search using pre-defined eligibility criteria. Collect and organize data from articles including details about methodology, interventions and outcomes. Perform network meta-analysis of the data. Present analysis to expert panel. Draft systematic review and guideline manuscripts for publication in journal(s). The research team screened more than 10,000 articles over the course of several weeks, and from these, selected more than 40 studies that met the requirements set by the experts. It was tedious and intense work that required a lot of focus. For me, the most difficult step of this process was the data extraction. After combing through the often complex reports included in our review, we had to extract data from them and organize it to undergo further analysis. Every study was organized and written differently too, so trying to fit the data into a comparable format made the task even more challenging and time-consuming. It was also one of the most crucial steps in the guideline development because it prepares the data for a network meta-analysis. This technique was something that I had not experienced before, and I was very impressed with the ability to compare data from each study allowing for evidence-based clinical recommendations to be developed. For example, even if a study did not directly measure whether fluoride varnish is a more effective intervention at arresting an approximal noncavitated lesion than say resin infiltration, we could use indirect comparisons from other studies to figure this out. After working on this process with the EBD Team, I definitely have a greater appreciation for the science and methodology used to create the ADA clinical practice guidelines. It is something that I plan to utilize after dental school and has had a profound impact on my career. As I prepare for a residency in periodontology, I will bring what I’ve learned from this amazing experience in how I understand research and data, and how useful guidelines are in making a treatment decision. I hope you’ll check out the guidelines and find them useful in your practice. 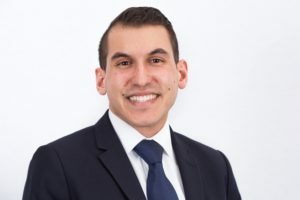 Adam Parikh is a New Dentist Now guest blogger and is a fourth-year dental student at Midwestern University College of Dental Medicine-Illinois in Downers Grove. He has been an active member in organized dentistry throughout his time in dental school as a member of ASDA, the Chicago Dental Society, and the American Dental Education Association. Adam will be continuing his education next year, as he was recently accepted into the Graduate Program in Periodontics at the University of Louisville.